There is a dignity and beauty in the weathered boards of a house that can remember a hundred years of history. The old handmade bricks and hand planed planks just ooze stories of good times and warm days as well as snowy days and Christmas wreaths. There is a character to a homemade brick that may still retain the print of a human finger, a print made from the very ground where it was used, that gives character to an old building. "Sometimes wish I could paint every one of these old structures." For the most part, painters deal in natural beauty and nostalgia. Dempsey Essick is no exception. 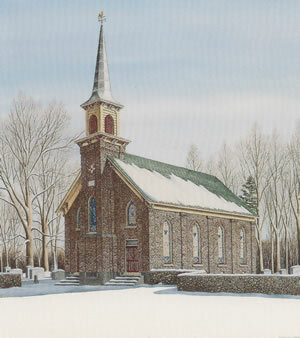 His aim in life has been to recognize the simple beauty in everyday scenes and objects and it has been his great good fortune to have the skill to record those scenes in memorable watercolor paintings. Dempsey will add no more than two initials to the knot of this tree. 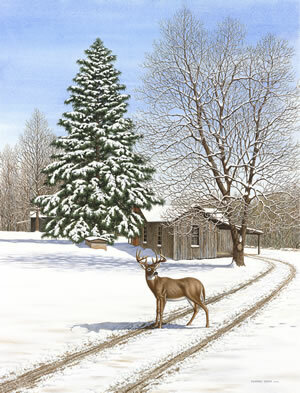 For “The Old Place,” his latest painting, Dempsey has returned to his grandparent’s homestead where, as a young boy, he helped pull tobacco and enjoyed many hours on the farm. As always the artist has hidden a rebus type image of a hummingbird in the painting. 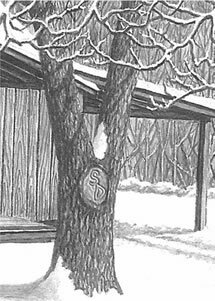 Please note: Dempsey will, at no charge, add no more than two initials to the knot of the tree in the foreground. How special! 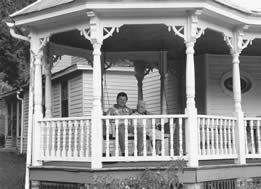 “When I was a boy growing up during the 50’s and early 60’s time spent at Grandpa and Grandma’s house, which we called The Old Place, was special. I can still smell Grandma’s light rolls and country ham cooking. 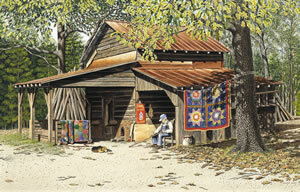 I have vivid memories of Grandma telling ghost stories at the tobacco barn during curing season. 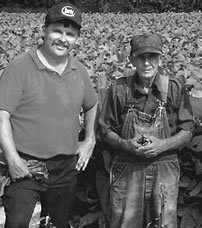 The time spent helping Grandpa pull tobacco was quite an experience. Dempsey working with his small paintbrush. in preparation for the painting. Dempsey Essick had heard about the Pisgah Covered Bridge in Randolph County for years but had never visited the scene until last fall just after the leaves had dropped from the trees. "I was at the new New Bridge Bank in Asheboro admiring the newly hung Essick Art when the subject of the covered bridge came up. New Bridge Purchasing Manager, Kathy Wilkerson, handed me a local magazine containing a photograph of the bridge in it and I was immediately drawn to it." The scene stayed in Dempsey's mind, percolating like a strong pot of coffee, all winter. In February he had determined that this just had to be his next painting. He went again and began to select a point of view and to sketch and photograph the wonderful old wooden structure from every angle. 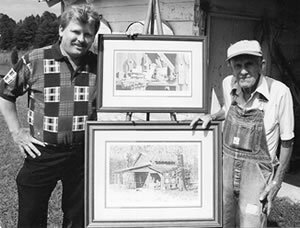 Asked about his reason for selecting the Pisgah Covered Bridge as the subject of a painting, Dempsey said that one of his favorite subjects had always been the series of paintings he did of the house at Two Meeting Street in Charleston, SC. But, from his first sighting of the old covered bridge in Randolph County he had felt that perhaps he had found a scene to challenge the Charleston paintings. "You have to be there and feel the antiquity," he said. "You have to stand by that old bridge and picture, in your mind, all the people and old wagons loaded with hay and all the buggies and hear in your mind the sound they make as they go over the old plans in the bridge." Dempsey is at his artistic best when he is portraying an old wooden structure and the Pisgah Covered Bridge is no exception. His selection of a vantage point from the creek bed is designed to show the grand old bridge from the point of view of one of the woods creatures, a deer or a rabbit, or perhaps a chipmunk. 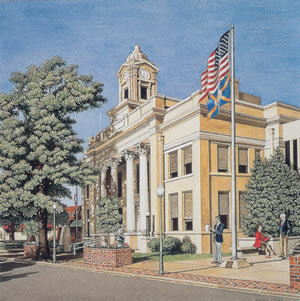 Plans were to release the painting in Spring but Dempsey's very nature and intensive technique would not allow it. "I could not rush it. Every leaf, stem, and branch had to be addressed. I had to do it justice and consequently it turned into a Fall Release"
The Pisgah Covered Bridge was built in 1903 and is located 12 miles south of Asheboro, NC. Turn right on State Road 1114 in the town of Ulah and the bridge is about eight miles on the left just past the Union Community Center. Picnic tables are provided and you will enjoy hiking around the trail. 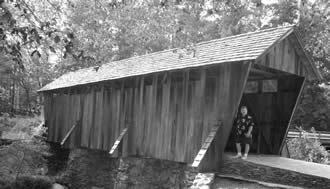 "The first time I walked to the Pisgah Covered Bridge, I stopped in my tracks as I looked at the wood boards and the rock foundation stones with all the shadows from the streamside trees. I listened to the ripple of the stream flowing under the bridge. The scene captured my imagination so that I could not wait to get started painting. Thousands of shadows cast from different directions created an image of abstract shapes that had wonderful order. I actually sat right there on a rock for a long time and breathed all this in. As I got into this painting, I realized it was going to take much longer than I had anticipated to complete it. My personality as an artist is that I cannot take shortcuts; this is my strength and my weakness. When I paint trees I pay attention to the bark, the limbs, the shadows, and the knot holes When I paint rocks I detail their different shapes and colors and the moss growing on them. My goal is to portray the scene as natural as possible. 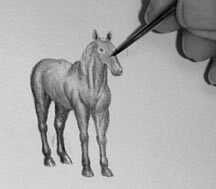 To put it simply, I take as much time as is required and I cannot be rushed. I want the viewer to feel that they can walk right into the scene and sit down on the same rock I did. 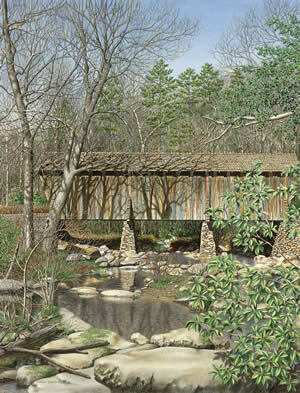 That is why "Pisgah Covered Bridge" took 560 hours to paint." 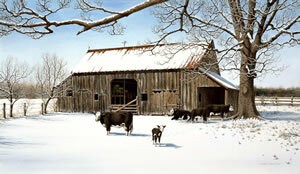 "Early Spring at the Fritts Farm"
It's everyone's dream of how a farm should look. 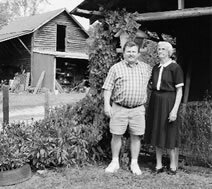 For most of this century, travelers along the Winston Road north of Lexington, North Carolina, and passengers on the train next to the road, have been captivated by the sight of the Fritts Farm. They first notice the big red barn surrounded by pastures with grazing cattle, then the green roofed house partially obscured by surrounding trees. It's a house with an unmistakable nineteenth century look; two stories with seven gables and covered porches on every side. It is obviously a dwelling built for a large family. The new century had barely begun when David Thomas Fritts contracted with John Sink to build a new family home to accommodate his growing family. 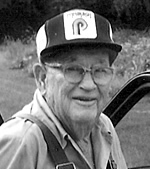 David eventually raised ten children in what was then called Maple Grove Farm. One of the Children, Charles Ray, and his wife, Helen, still lives in the house. 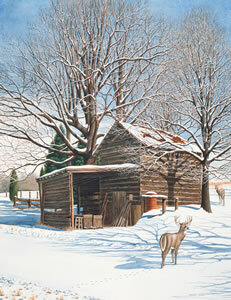 Charles Ray's son, Henry, has restored the original loghome that his grandparents occupied. In selecting a viewpoint, Essick has chosen the west face ofthe Fritts home because that is the side most familiar to people passing on the main road. 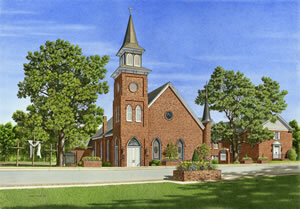 For the same reason, he has painted the scene in early spring before the leaves conceal much of the building. 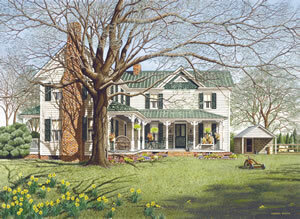 All the characteristics of an Essick painting are present in "Early Spring at the Fritts Farm." 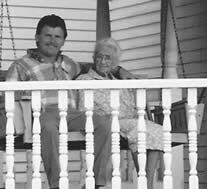 His infinite attention to detail, his flawless use of light and shadow to give depth to the scenes and his sense of perspective and composition which puts the viewer in the scene as surely as if she had been seated in the Adirondack bent-willow chair on the Fritts side porch. 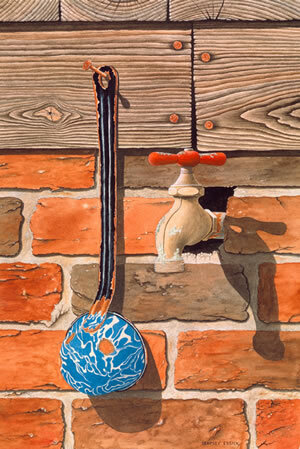 Dempsey Essick does not require the viewer to stand back several feet in order to get the full impact of his work. Rather, the viewer is invited to get up close and examine the detail of individual bricks in the chimney and the individual boards in the siding. The leaves, the blossoms, the blades of grass, all invite an examination and appreciation of the hours of meticulous brushwork that go into an Essick painting. Look closely and you will see a cat on the porch, a rooster near the old smokehouse, and cows in the distance. 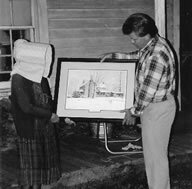 Dempsey's wife, Shelley, says that of all Dempsey has ever painted, "Early Spring at the Fritts Farm is my second favorite piece. The brickwork on the chimney and the shadows on the brick are breathtaking. 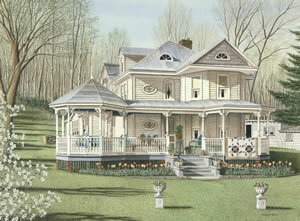 I am amazed every time I look at the painting of this hundred year old home. 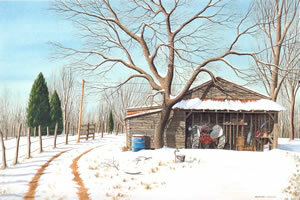 I would love for Dempsey to do a second painting there of the Fritts barn." 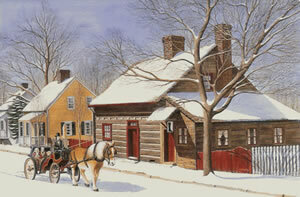 Old homesteads usually carry the name of the original owner/builder through the years. 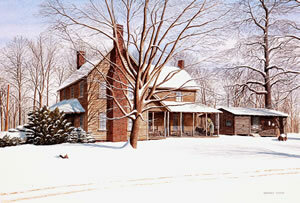 The 200 year old Hayden Place, on Wesley Chapel Road, in Davidson County, is no exception. 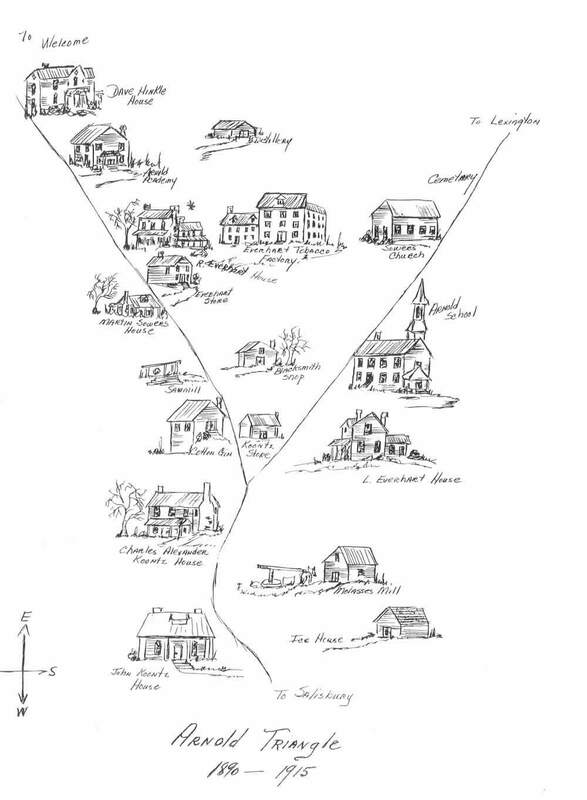 In 1797, after Jesse Hayden married Rosana Sloan, Rosana's daddy deeded the couple 646 acres of land along Potts Creek in the western part of the county near the Yadkin River. There the happy couple built their dream house. The house was occupied by Jesse and Rosana, and their descendants for the next 118 years before becoming a tenant farm after 1916. 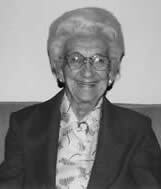 Mrs. Vadie Queen, the 82 year old lady who has lived in the Hayden place for thirty-eight years, is true to the legacy of Jesse and Rosana. 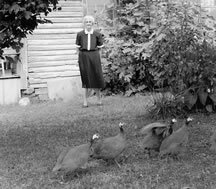 Mrs. Queen keeps chickens and still heats with wood and cooks on a wood stove. 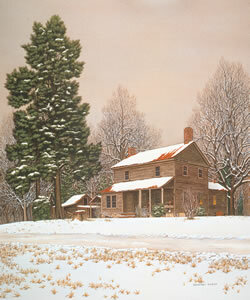 Dempsey Essick chose to depict the "Homeplace" in winter when the snow provides suitable highlights for the old dwelling. The trees in the background are barren, allowing the towering cedar in the front yard to be the primary focal point of the picture. 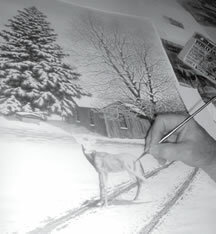 The artist's trademark realism is manifest in every aspect of the twilight scene. The view is to the west where the sky is still light just after the cold winter sun has set. Slush in the road has refrozen so that the sound of passing vehicles reverberates in the still countryside. 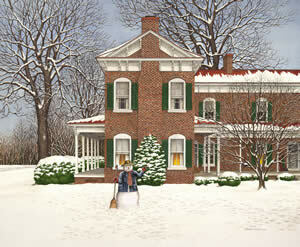 Admirers of Essick's work will be pleased with the wealth of detail in the "Homeplace." The hand-made bricks in the two chimneys; his rendering of each board and post in the house and out buildings; the delineating of each branch and twig in the leafless trees; all are elements of what has become the Essick touch. The viewer, seeking relief from the stark cold depicted in the painting, is warmed by a glow from the kitchen window. Images come to mind of the family gathered around the supper table, talking, laughing, recounting the day's events. In the meantime, a lone chicken can be seen scratching for food under the shrubbery. 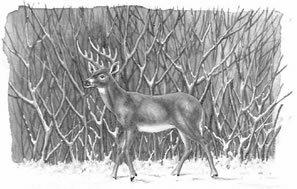 In "Early Crossing," Dempsey Essick has captured a moment just after daybreak on a winter morning when two deer have claimed their right to make the first tracks in the new snow. The setting is a familiar one to thousands of motorists who travel the road between Arcadia and Welcome in the northern part of Davidson County, North Carolina. 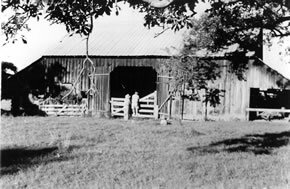 The old log tobacco barn was built of hand hewn logs over a hundred years ago by William Craver and his father-in-law, Mike Evans. Kitty and Luther Craver, who live right across the road, remember having friends over for overnight sleep-outs when they'd turn the curing into a social event. When the youngsters finished high school, they were given a patch of tobacco to raise, cure and sell to pay their college tuition. Years ago when I first started painting full time, I knew in the back of my mind that I would eventually paint the Craver tobacco barn. It is the kind of setting that appeals to me. 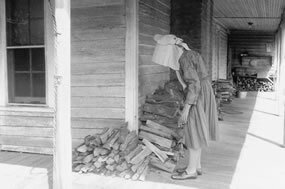 Having grown up on a tobacco farm, I feel kinship to the way things used to be when so many of the old long curing barns were still in use. You could see slim columns of smoke rising up from them all over the countryside in the fall of the year after the tobacco crop had been harvested. 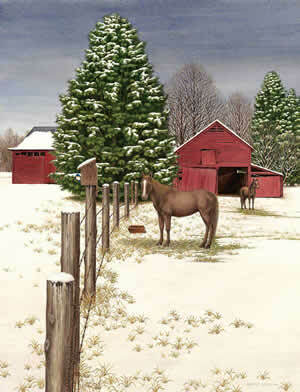 I depicted the scene early in the morning, just after daybreak, before any tracks had been made in the snow on the Welcome-Arcadia Road which passes just a few feet from the barn. 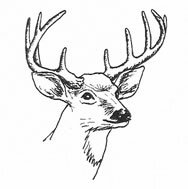 And when I thought of a focal point for the picture, the deer and a buck, seemed natural both as a symbol of family and because deer are one of God's most beautiful creatures. 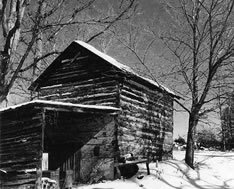 The old barn stands cold now but, with a little imagination, the viewer can envision that first autumn, at the turn of the century, before the hewn logs turned grey, when the builders, William Craver and Mike Evans, put in their first crop of tobacco to be cured. 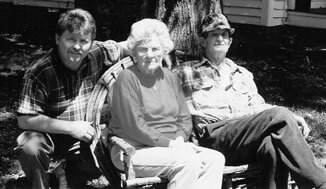 It was the beginning of a tradition of hard work and all night fire tending vigils that lasted until the final crops were sold to pay college tuition for William's grandchildren. The viewer, perhaps, remembering other quiet mornings when the grass was brittle underfoot and sounds echoed from barren fields, becomes engrossed in the scene, discovering one delight after another. The adze marks on the logs, a missing plank on the lean-to, some old tobacco sticks, the rust on the metal roof showing through the snow, are all pleasing. inally, it is impossible to resist the trees. Hundreds of large and small branches intertwined and overlapping in a tangle that defies description except to say that it is a typical example of Dempsey Essick'skeen perception and detailed brushwork. Every shed and garage has one. Usually referred to as the junk shelf, it's where all those items for which there is no regular peg or box, wind up. A cultivator blade, a hog scraper and an old mule shoe, all sharing a common shade of rust. The can for odd sized nuts, bolts and screws; a soft drink bottle half full of oil; these are the things that find a home on the junk shelf. 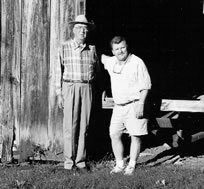 The shelf in "Easy Pickens" is located in a lean-to, beside Hubie Stafford's old tobacco barn in Guilford County, North Carolina. 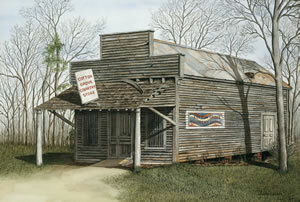 The hewn log barn was the subject of Dempsey's fall, 1993, release called "Hubie's Place". 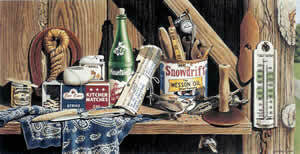 Hubie's personal items; a bandanna, his snuff can and whittling knife, recall bygone autumn days when he would sleep in the shed because the wood fires had to be tended and the curing temperature had to be maintained around the clock. The viewer, after discovering within the frame of the picture items as diverse as a broken folding rule and a box of wooden matches, comes away with the sense of having experienced a mini history of farming covering the era from animal drawn plows and wagons to present day trucks and tractors. Almost lost among the inanimate objects, a flight of wasps stand ready to defend their nest while, just inches away, a sparrow returns time and again to carry off seeds from a dried okra pod, and in the process, give "Easy Pickens" its name. Old houses draw Dempsey Essick to them like a magnet. No matter where he travels, the old buildings seem to call out to him. He is intrigued by their history and delighted by the people who preserve and live in the old structures. The house in "Shades of Autumn" was built by Theodorus Eaby in 1727 near New Holland, Pennsylvania in the heart of Amish country. 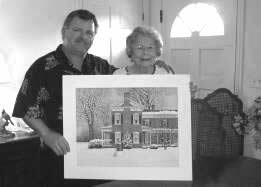 Recently the great-great, great-great, great-great grandson of Theodorus, Christian Eaby, and his wife, Dace bought and are restoring the old family homestead. 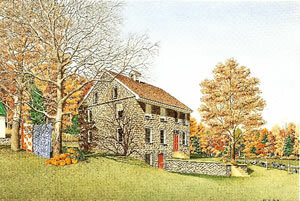 Dempsey has depicted the Eaby house as it appears on an Indian summer day with colorful foliage as a backdrop. His exact rendering of the stonework pays tribute to the workmanship of masons who erected the building over two and a half centuries ago. The scene harkens back to those early days when the paint on the doors and window frames was still fresh, pumpkins for Thanksgiving had been harvested, and the lady of the house had hung handmade quilts out to soak up the warmth of the fall sunshine. The realism is such that a viewer can almost smell the aroma of fresh baked bread and hear the bell in the rooftop cupola calling the workers in from the field while cows graze in the meadow. 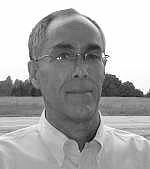 "Shades of Autumn" enhances Dempsey Essick's reputation for seeking out historical subjects that reflect the early rural landscape of our country. The old tractor shed on highway 150, in the northern part of Davidson County, North Carolina, originally caught my attention because it was so much like the one on my dad's farm, where I grew up. Every time I would drive by it seemed to draw my eyes like a magnet. Then, one day about two years ago, just after the last snow of the season, I saw the picture I wanted. The snow was beginning to melt under a sunny sky which gave me the contrast of strong shadows from trees and fence posts and the snow on the-ground reflected enough light into the shed to reveal tools, gas cans and equipment that had been stored for the winter. The only thing missing was a tractor. You can't have a tractor shed without a tractor so, what you see in the painting is the back end of my dad's tractor. Old buildings have always appealed to me. I like to learn their history - who built them and when. I didn't expect to learn much from the history of an old farm shed so you can imagine my surprise when I met Mrs. Irene Miller and found out that this shed was originall y a Gulf service station and country store. The building was put up by Mrs. Miller's father-in-law, David Miller, in the 1920's and, for almost three decades, it was known as the "D.K. Miller Service Station". Mrs. Miller showed me some remembrances from when the store was a thriving business. She has a patio table that her husband, Odell, made from the big, round, Gulf sign that once hung out by the highway. And there was a clipboard full of credit slips from the 1930's showing sales of gasoline at ten cents a gallon, coffee at fifteen cents a pound and Tuberose snuff at ten cents a can. Looking through the slips I could picture, in my mind, country ladies in gingham dresses, passing out the latest news on who was getting marrried or having a baby and the men in bib overalls, discussing the Hoover/Roosevelt campaign and children buying stick candy, with a shiny prize ring around each stick, for a penny. The advent of supermarkets, a changed road and the beginning of gas rationing during World War II, forced the D.K. Miller Service Station out of business early in the 1940's. 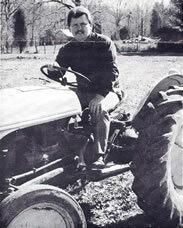 Mr. Miller moved the building a hundred yards west of its old location and it served out the remainder of its days as a tractor shed. I painted Spring Thaw in March, 1990, and it got so much favorable comment at shows in Winston-Salem, Lexington, Gastonia and High Point, with many people saying that they would like to have a print, that I decided to use it for my spring release. Just a few months after I had completed the painting, the old building was torn down and the tree in front was removed so now, after years of duty as a service station, store and shelter for farm equipment, the scene you see in Spring Thaw is just a pleasant memory.